"The Christian Cinema web site was very well layed out and easily accessible. My order arrived within three days. I was very pleased with the ease and speed thatI was able to receive my DVD. Thanks!" Presenting a new small group study from City on a Hill Productions. Twenty times in the New Testament, Jesus issued a compelling and challenging invitation to Follow Him. He's not interested in mere fans. He doesn't want enthusiastic admirers. He wants Completely Committed Followers. 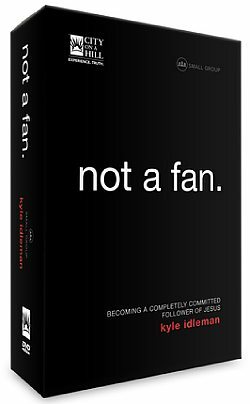 Based on the engaging approach of Kyle Idleman, this one-of-a-kind small group study examines what it means to deny one's self and truly follow Jesus. This unconventional small group experience is a cinematic journey through a series of six mini-movies providing a unique perspective to help shape today's believer into a first century Christ-follower. Follow the journey of Eric Nelson, a man leading a compartmentalized triple life as a pleasure-seeking rebel, a cutthroat corporate executive, and a nominal Christian. When confronted with a near death experience, Eric embarks on a spiritual journey that transforms his commitment to Jesus Christ and tests the faith of his friends and family. I am admittedly biased toward the studies which are produced by City On A Hill, Productions, but with very good reason. Having already bought and gone through, "H2O: A Journey Of Faith," as well as, "The Easter Experience," I was very excited when "Not A Fan" was being released, and I was not at all disappointed. The quality of the product is outstanding, as is always the case with City On A Hill products. But most importantly, the message within the study is simply awesome. Going through this six-week journey and being led from "fan" to "follower" is definitely one which will change your life. I can't recommend this strongly enough. You'll love it. I'd give it ten stars, if I could.